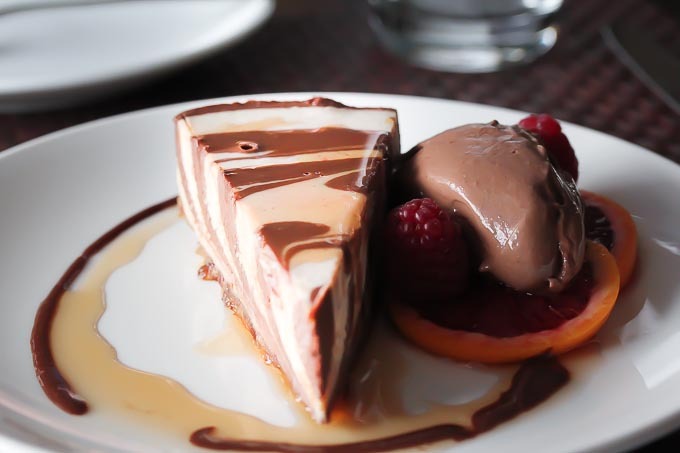 A show-stopping blood orange and chocolate swirl raw vegan cheesecake will charm your guests at your next gathering! 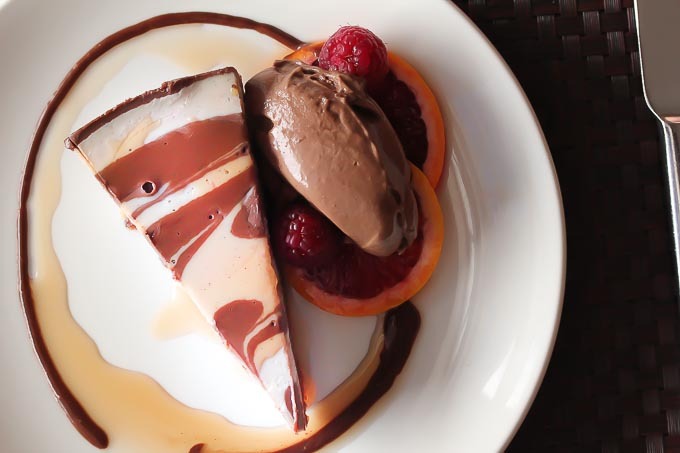 Raw vegan desserts are a great introduction to plant based cuisine-everyone likes dessert! This vegan cheesecake is a cashew base with a walnut date crust. You can use a variety of sweeteners-the ones we recommend here are agave, maple or honey. They each have a different flavor profile, so you should feel free to experiment or just use what you have on hand. If you want to substitute dates for the liquid sweeteners, you may need to add a little water to your cheesecake mixture to help it blend smoothly. In a food processor, pulse the nuts, cinnamon and salt until the nuts are crumbly, but not a dust. Add the dates and pulse a few more times until the mixture begins to stick together. Press into the bottom of a 9” spring-form pan. Set aside. Puree all the ingredients of the blood orange cheesecake flavor in a blender very well until smooth. In a separate batch, puree the chocolate cheesecake ingredients until smooth. Pour them both into the prepared crust, alternating flavors so a swirled effect is achieved. Allow the cheesecake to set up overnight in your refrigerator before serving. It was hard to find a good recipe but thanks to you I finally got it. Thanks.